Cross Hatching, is a style that has been used in art making for many years by most civilisations. Its most common application in art making is in drawing where the artist wishes to 'fill' or shade a part of the artwork. Hatching is generally made by close parallel lines executed in drawing materials such as ink, pencil, charcoal, crayon, paint and the like, whereas Cross Hatching is what it sounds like; another hatching pattern crossing the first one. 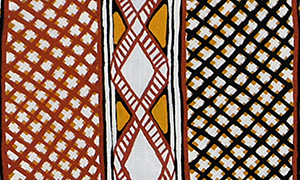 In Australian Aboriginal Art, the fine technique of Cross Hatching (known as 'Rarrk') has taken on a more structured and stylised appearance, and can have significant meaning when it is used in an artwork. It is used largely by the artists of the Northern Territory, and particularly in Arnhem Land in their bark or other fine work paintings, some of which are very old. 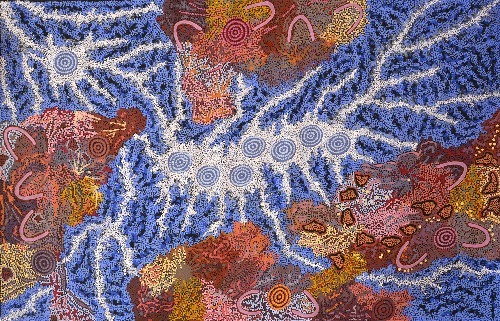 One can marvel at how such fine and perfect line work can be achieved with somewhat basic tools, but the usual way Aboriginal artists achieve this finesse is to pull a few strands of long human hair, hold them together at one end, dip them deep in the paint and then use the length of paint coated hair as a brush. The hair length is carefully pulled in a straight line across the surface of the artwork. The hairs, already straight with the weight of the paint, take the least line of resistance and straighten out perfectly, producing a fine, straight line. The process is repeated at regular intervals and then when this is dry, the same is done in the other direction. Any overlap of paint from the area to be cross hatched can just be wiped off while it is wet as the work is in progress.. 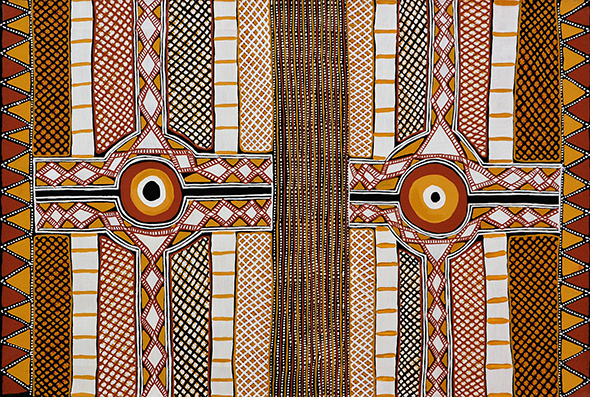 The Aboriginal artists believe that these overlaid patterns of colour and line contain the power associated with that particular painting or story subject, and this is easy to imagine given the awesome images this technique creates.